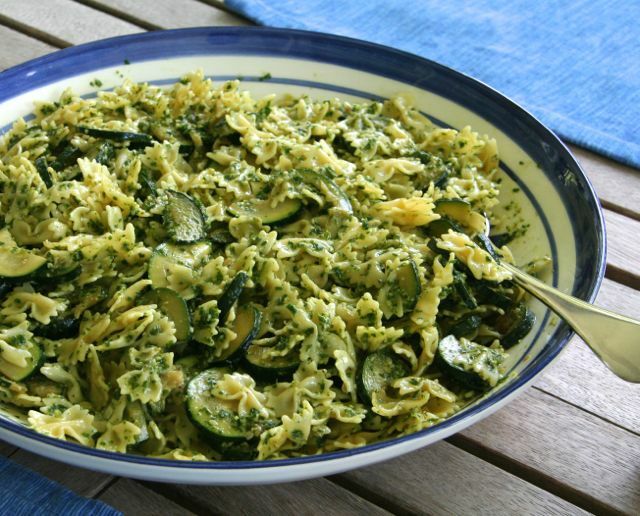 Parsley is transformed into a really fresh-tasting pesto in this dish. I had purchased a giant bunch of parsley only to get another giant bunch of parsley in my CSA share the next day. (Why does that always happen?) This dish used almost all of it up! 🙂 I also had zucchini in my CSA box so this was the perfect recipe. We ate it at room temperature and it was wonderful. This pasta dish would also be terrific served warm or refrigerated and served as a cold pasta salad. This dish was adapted from a “staff-favorite” recipe in Food and Wine, contributed by Melissa Rubel Jacobson. I used roasted walnuts instead of almonds, increased the amount of cheese, and used mini-farfalle pasta. Meanwhile, in a food processor, pulse the garlic clove until it is finely chopped. Add the walnuts and pulse until they are coarsely chopped. Add the parsley and 1/2 cup of the olive oil and process until the parsley is finely chopped. Add the Parmigiano-Reggiano cheese and pulse just until the pesto is combined. Season with salt and pepper and scrape the pesto into a large, shallow serving bowl. Make Ahead: The pesto can be refrigerated overnight. This looks great and the photo is beautiful!! Ways have recipes for amazing pestos and sauces :). Thanks for sharing this. I am thinking to use this pesto as a side dip next time ;). Your dish looks so tasty! I love pesto sauce, but have yet to attempt to make it. Will try out your recipe when I get the chance–thanks for sharing it! Pesto is so quick and easy to make. Full of flavor too! Hope you enjoy it! Wooow! That luks soo yumm! That pesto sounds delicious! I wish I could taste it. The WordPress like system is still not working so I can’t like your post using the like button, but I can say I like it. Thanks and have a wonderful weekend! This looks great! Will definitely have to try it this summer!